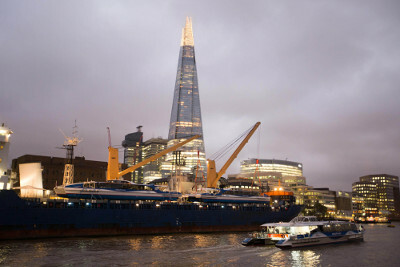 The £6.5 million investment in new fleet by owners, MBNA Thames Clippers, represents a significant enhancement to London’s transport infrastructure and river travel in particular. It is the latest step in a series of boosts to river transport in the capital, with the forthcoming opening of the new Plantation Wharf Pier and the installation of Oyster card pay as you go readers at all piers served by river bus services, making it even easier for the growing number of passengers to use. 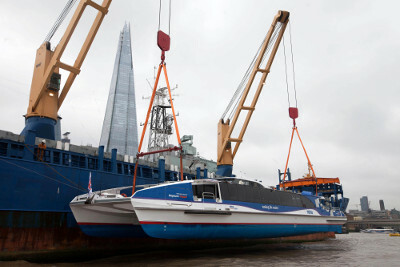 The 150-passenger, 35m long ultra-high specification twin catamarans – Galaxy Clipper and Neptune Clipper – are the first new boats to be added to the popular MBNA Thames Clippers river bus service in seven years. Specially-designed to be exceptionally lightweight and with a sleek hull format, the vessels will be the most efficient and technically advanced river buses on the Thames. They will add extra capacity to the popular RB6 route from Blackfriars to Putney, which has already seen a 40% increase in passenger journeys in the last 12 months. They will also provide extra capacity on other routes during periods of high demand. MBNA Thames Clippers is at the forefront of delivering against London Mayor Boris Johnson’s River Action Plan to double passenger trips on the Thames by 2020. In 2014 alone, MBNA Thames Clippers passenger numbers increased by half a million to 3.8 million. In 2016 the growing MBNA Thames Clippers business is projected to carry in excess of 4.3 million commuters and visitors around London on the river. By the end of 2016 MBNA Thames Clippers will have welcomed over 34 million people to its fast, efficient and comfortable river bus services since its inception in 1999. The River Thames is a major contributor to London’s economy and according to the latest Port of London Authority research, delivers £4 billion in gross added value to the UK, and supports in excess of 43,000 jobs. There is predicted to be £1 billion worth of investment in and around the tidal Thames – which covers the 95 miles of river for Teddington Lock to the North Sea – over the next five years. “Just over a year ago MBNA Thames Clippers announced that we would add one new boat to the fleet to bring more commuting options to those travelling around London. Today I am very happy to declare we have in fact doubled on that promise with two new boats; Galaxy Clipper and Neptune Clipper. In a further boost to river transport, a new £2.8 million pier will open on the south bank of the Thames between Battersea and Wandsworth bridges next month. Plantation Wharf, which is built and owned by Plantation Wharf Pier LLP, will improve transport links for local commuters and residents, allowing them access to the RB6 service which runs during weekday morning and evening peak hours. Transport for London (TfL) has also recently installed pay as you go Oyster readers across all piers served by MBNA Thames Clippers river bus services, improving the experience for regular customers and visitors. In the summer of 2016, TfL will deliver contactless payment for the river bus service. “This is a major step for river transport and a real boost for the service along the western reaches to Putney. Next step – all day services to the west." The introduction of the new fleet and development of services will see the creation of an initial 14 new jobs at MBNA Thames Clippers. In addition to this London River Services are funding improvements to key central London piers at Westminster, Embankment and Bankside, providing much needed additional berthing capacity. The addition of the new vessels has been made possible by the commercial partnership with leading credit card provider, MBNA. MBNA is driving payments innovation in the UK. The relationship will lead to new ways to pay and improved ticketing for customers. For more information on MBNA Thames Clippers please visit www.thamesclippers.com. An Edited Package (A-Roll) and Rough Cut footage from the launch will be available to all media, free and without restriction on Monday 19th October 2015. Details on how to access the footage are below. In 2006 AEG, owners and operators of The O2, acquired the majority stake in the company and since then the fleet has substantially grown to 13 vessels, now 15. River Bus Express for The O2 is an additional fast direct service between London Eye, London Bridge and Canary Wharf to The O2 at North Greenwich on arena event nights. Headquartered in Chester for over 20 years, MBNA Limited is a wholly owned subsidiary of Bank of America Corporation (NYSE: BAC). It is one of the UK’s leading credit card providers and was voted Credit Card Provider of the Year for the second year running in the Consumer Moneyfacts Awards 2015. MBNA is committed to implementing innovations to make life easier for customers. For more information, visit the company’s website at www.mbna.co.uk or @mbna.